According to data published by Bridge to India, below is the list of top EPC contractors in India for rooftop projects commissioned till October 2015, alongwith their respective marketshares. Tata Solar is a tier 1 bankable module manufacturer with 25 years history in India. It has one of the biggest and oldest solar panel manufacturing operations in India, having commissioned 175 MW of EPC projects, 43 MW of solar rooftop projects and exported 600 MW of modules till date. Sukam is considered to be India’s largest power solutions company. The company is the largest solar inverter manufacturer in the country. 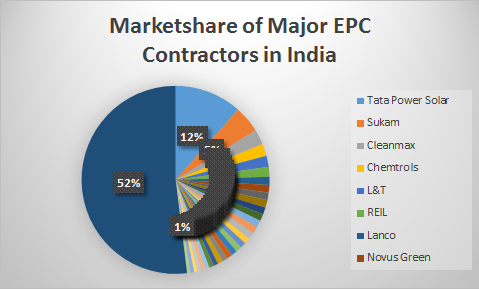 Sukam and Tata Solar are the largest players in teh residential EPC market in India, commanding more than 30% marketshare. Tata Solar also has immense presence in the utility scale sola projects in India. Cleanmax is India’s other rooftop solar developer with installations of more than 20MW. Other leading names like Vikram Solar, Waaree Solar, Lanco Solar had marketshares ranging between 0.7-1.4%. With 6.5 GW of solar rooftop installations expected by 2020, India possess a immense potential in this segment and leading EPC players will have a big opportunity to leverage from this growing market. 525 MW of total rooftop capacity was installed in India till October 2015, out of which 210 MW was in the industrial sector, 172 MW was installed in the commercial sector and remaining 143 MW was installed in the residential sector. Tamil Nadu was the largest state interms of rooftop installations, installing 76 MW (industrial installtions being the largest with 34 MW), followed by Maharashtra with 52 MW installed (industrial sector being the largest with 27 MW). Rays power Infra was awarded 3rd largest solar EPC by bridge to india. But it’s even not mention here. Can you please explain the reason..?? Thank you for reading my blog and for writing about Rays Power Infra. The list I prepared is from data taken from Bridge to India prepared for top EPC contractors in India in rooftop projects commissioned till October 2015, alongwith their respective marketshares. I checked their website and see that they were Ranked 3rd in Solar EPC category in India by Bridge to India in September indeed. However I am not sure why they haven’t been mentioned by BTI in their report. Could be their marketshare in India was not at large as the others mentioned in the list. In the list 52% market shares belong to others. can u please tell the companies which belongs to others..?? There are many marginal players with marketshare less than 0.5%. Sorry, but I am not aware of their details. Can we have this list and market share updated as of 2017?